More Info for Senior Appointment — Gigante Productions, Inc. Welcome Class of 2019! Your adventure begins today! Gigante Productions is excited to be your Senior Photographer! Our photographers are very creative and focused on making your senior portrait experience an enjoyable one. The formal wear for the girls (black drape) and boys (tux shirt, jacket, and tie) will be provided for you. Gigante Productions also provides caps, tassels, and gowns for your school, if required for your session. The session fee will be collected when the senior appointment is made. We accept Master Card, Visa, Discover or American Express. If you need to cancel or reschedule your appointment, please call our studio at 813-907-1078 48 hours before your appointment, otherwise there is a $10.00 rescheduling fee. you can always add accessories and cute shoes to spruce up your outfit. • Make sure you are clean shaven and if you normally sport facial hair, make sure that it is freshly trimmed and groomed. Fill out the form on our computer with your address, email addresses (both student and parents), phone numbers and student ID. If you have any ideas or special requests, please relay them to our photographers. These pictures are all about YOU! 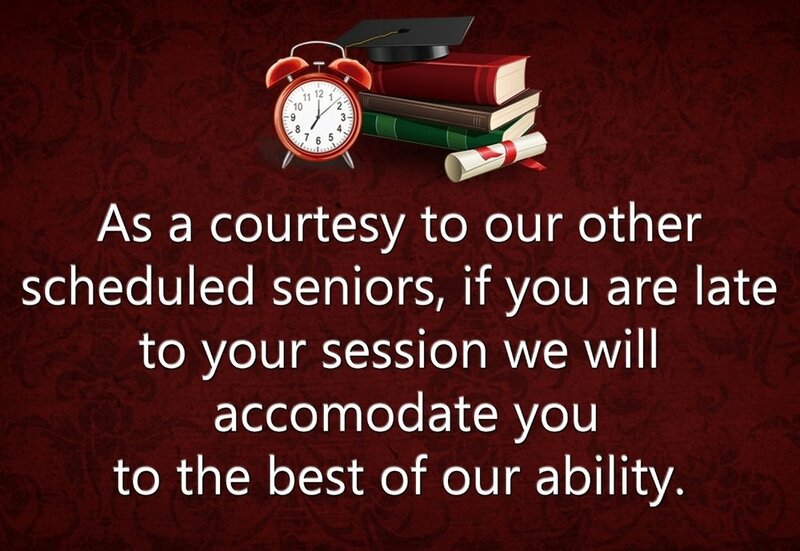 For privacy of our Seniors, parents will remain in the lobby while your session is taking place. Yearbook images must be picked online by your school's deadline or the lab will pick for you.